Readers of MultiLingual magazine will know about the “Takeaway” section towards the back of the publication. It’s a kind of bully pulpit-meets-12 Step meeting “burning desire” platform, along the lines of U.S. public radio station KQED’s Perspectives program. I have written a few MultiLingual “Takeaways”, and made other contributions, on user experience-related topics that frankly do my head in: Why the Globalization, Internationalization, Localization, and Translation (GILT) industry appears to run scared of user experience, or indeed are user experience and the GILT worlds even compatible in terms of coming up with a common language they should be trying to speak, for example. Head. Stone wall. Bashing head off. So, I am delighted to say that someone, namely Lynne Bowker of the University of Ottawa, Canada, has been paying attention to my words. 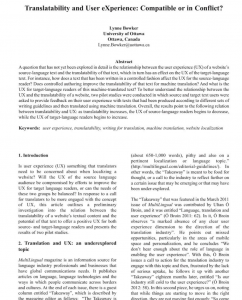 Lynne has researched and written a paper published in Localisation Focus called “Translatability and User eXperience: Compatible or in Conflict?”, citing my MultiLingual sources, amongst others! Localisation Focus: Lynne Bowker explores translatability and user experience. Are they compatible? Lynne has also spoken about the subject at various events. Watch out for other places where this hot topic might surface and join in the debate! I am always delighted to cause trouble inspire others to take an argument further for the benefit of the community. The whole point of “Takeaway” really. And, if you have an idea for the “Takeaway” section of MultiLingual, contact the editor.